Figure 6.10 Crater morphologies. The diameter ranges are for the Moon, and are approximate. become flooded by lavas, though this might not happen for millions of years. The larger craters are also modified by isostatic adjustment (Section 4.1.5). □ What effect do you think this will have? A crater is a deficit of material, so isostatic adjustment will cause uplift within the crater at the surface (and horizontal motion deeper down). This reduces the depth-to-diameter ratio to 1/20 or less. Craters of all sizes are continuously subject to erosion and partial infill by some material or other. The actual size ranges of the different types of crater depend on the gravitational field and on the strength and density of the surface layers, and so vary from body to body. For example, on the Earth, which has a rocky surface like the Moon but a larger gravitational field, central peaks occur in craters as small as 6 km diameter. On the icy surface of Ganymede, which has a comparable gravitational field with the Moon, they occur in craters down to about 10 km in diameter. As well as the crater itself, there will also be evidence of the ejected surface material, notably rays, ejecta blankets, and secondary craters, i.e. craters produced by the impact of ejecta thrown out by the primary impact (Figure 6.11). These features, like the crater itself, are subject to modification through erosion and through deposition of material. Impact craters can be used to determine the age of a surface. The older a surface, the greater the number of impacts per unit area it will have accumulated. Therefore, a heavily cratered surface on a planetary body must be older than a lightly cratered surface. Figure 6.12 shows a heavily cratered region on the Moon adjacent to a much more lightly cratered region. Clearly the latter is the younger surface. For the Moon as a whole, Figure 6.13 shows the number densities of craters of different sizes, i.e. the number of craters per unit area in defined ranges of diameters. These densities are known with good precision. Two graphs are shown, the one averaged over the lunar highlands, the other averaged over the lunar maria, which are the smooth, dark areas in Plate 7. ('Maria' is the plural of 'mare' (ma-ray), Latin for 'sea', though we now know that there are no seas on the Moon.) The graphs clearly show that for the Moon as a whole the maria are younger than the highlands. Regional studies show that even the oldest mare is younger than the youngest highland area. Both graphs show that the smaller the craters, the greater their number density. Therefore, the smaller the kinetic energy of a projectile, the more numerous they are. Among the great range of projectile masses, impact speed is uncorrelated with mass and so, broadly speaking, Figure 6.13 shows that massive projectiles in the Solar System have been fewer in number than less massive ones. This is in accord with our understanding of the size distribution of planetesimals (Section 2.2.3) and with the subsequent evolution of the remnant population. 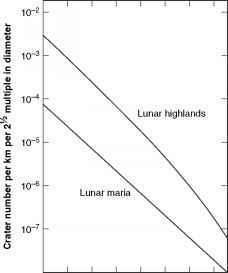 Figure 6.13 Number densities of lunar craters of different sizes, averaged over the lunar highlands and over the lunar maria. asteroids. That this has long been the case is indicated by data from lunar surfaces of different radiometric ages (see below), which show that the size distribution has not changed much over the past 4000 Ma. A significant cometary contribution cannot be ruled out, particularly if the size distribution of comets has always resembled that of the main belt asteroids - the data on comets are too sparse to tell. Bombardment on all the terrestrial planets seems to have been caused by the same type of population. 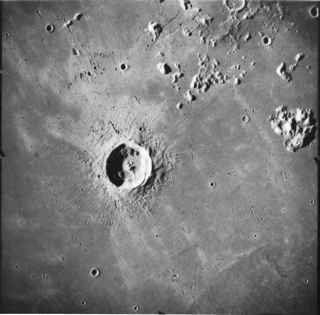 In what sense is the age of a surface indicated by craters? On a given planetary body, one surface will have a lower crater density than another because of some resurfacing event that obliterated some or all of the existing craters. An obvious example is a flood of lava. Another is melting of the surface. In such cases, the age of the surface indicated by its crater density is the time in the past when such resurfacing occurred. Craters can also be obliterated by various erosional or depositional processes. These will obliterate small craters much more rapidly than large ones. This is a different sort of resurfacing, continuous in time rather than concentrated near to a particular time, and it is important to avoid confusing its effects with those that result from lava floods and the like. For example, suppose that erosion is more powerful near the poles of a planet than near its equator. The crater density at the poles, particularly for small craters, will consequently be lower than at the equator for surfaces of equal age. □ How could this be misinterpreted? This could be misinterpreted to mean that the polar regions had been resurfaced by lava or by melting more recently than surfaces elsewhere. It is therefore common to exclude from counts those craters with diameters of less than a few kilometres. Further complications arise from the need to avoid counting craters of volcanic origin and secondary craters. Fortunately, most volcanic and secondary craters have morphologies and spatial distributions that betray their origin. Again it is wise to exclude small craters, many of which will be secondaries. A final complication is the phenomenon of saturation. 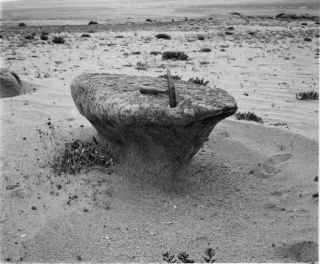 A surface becomes saturated with impact craters when further impacts, on average, obliterate as many craters as they create. 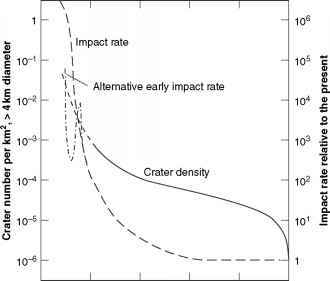 It is then not possible to distinguish between older and younger saturated surfaces on the basis of impact crater densities alone. 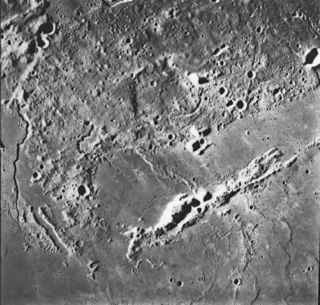 The most heavily cratered parts of the lunar highlands are saturated, as might be regions on some of the icy-rocky satellites, though definitively saturated surfaces in the Solar System are rare. One measure of saturation is the degree of randomness of the spatial distribution of craters. Simulations show that as an area approaches saturation, the random distribution that characterises subsaturated areas becomes more uniform as sparsely cratered subareas acquire more, and subareas near to saturation are little changed. • rates of erosion and deposition. Unfortunately, such differences are rarely well known, particularly the first. The bombardment history depends (among other things) on the local flux of potential projectiles. Differences between local fluxes are poorly known. For example, Mars is close to the asteroid belt, and so will surely have been more heavily bombarded than the Moon. But estimates of exactly how much more are highly uncertain. One estimate is that a (unsaturated) surface of given age on Mars has received twice the number of impacts as a surface of similar age on the Moon. If this is the case then we can estimate (with appreciable uncertainty) whether the surface on Mars is older or younger than a particular surface on the Moon. To obtain absolute ages we need to know in absolute terms the cratering history of at least one body, and how to apply the data to other bodies. Only for the Moon do we have the absolute ages for surfaces with widely different crater densities. These ages have been obtained by radiometric dating, and they have enabled us to deduce the rate of impact cratering on the Moon to about 4000 Ma ago. The crater densities and corresponding absolute surface ages are shown in Figure 6.14 for the total number of craters larger than 4 km in diameter. (Smaller craters are excluded to avoid the problems noted earlier.) Terrestrial craters are few because much of the surface is young, and because erosion and deposition are very active. The limited data for the Earth have been used to help get the curve at young ages (after correction for Earth-Moon differences). The uncertainties in the data are not large, and on the y axis in Figure 6.14 correspond to a factor, very roughly, of 1.5 either way, not huge on a logarithmic scale. The curve for times preceding 4000 Ma is shown dashed, because it is an extrapolation, older lunar surfaces being saturated. Figure 6.14 Crater densities versus surface age in the Earth-Moon system, and an inferred impact rate. is called the heavy bombardment. Any peak during the latter part of this time is the late heavy bombardment. Not shown in Figure 6.14, because it is not quantified, is evidence of a peak in impact rate on the Moon at 3900 Ma, lasting about 100 Ma, perhaps caused by a comet crashing into the asteroid belt. This peak would be the last gasp of any late heavy bombardment. In applying the data in Figure 6.14 to other bodies we have the same sources of uncertainty that we encounter in placing surfaces in age order, particularly the differences in local fluxes of projectiles through the ages. This leads to some uncertainty in placing absolute ages on various surfaces on Mercury, Venus, and Mars. The only feature that presumably has roughly the same age everywhere in the Solar System is the decline of the heavy bombardment. Therefore, any near-saturated surface is likely to be older than about 3900 Ma. This reveals an interesting difference between the inner Solar System and the outer Solar System, with the orbit of Jupiter as a rough dividing line. On the most densely cratered surfaces, the relationships between the number densities and crater size are rather different in these two regions, which indicates that the sources of heavy bombardment projectiles were also different. This also seems to have been the case subsequently, and this makes for considerable uncertainty in placing absolute ages on outer Solar System surfaces that postdate the heavy bombardment. The difference in the sources is presumably because the asteroid main belt cannot act as a significant source of projectiles in this far-flung region. A plain called Chryse Planitia on Mars has a crater density of 2.2 x 10-4 per km2 for craters greater than 4 km diameter. (a) How many such craters are there in a typical area of 105km2 in Chryse Planitia? (b) Assuming that data for the Moon can be applied to Mars, estimate how long ago this area was resurfaced. Why is your value an upper limit to the age? 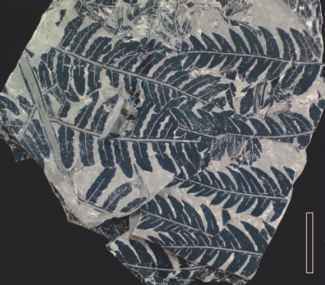 (3) those that deposit it, perhaps in a different mineralogical form. The gravitational field of the planetary body tends to cause settling to the lowest available altitude, and therefore gradation tends to level off a landscape. You have already met impact cratering. Additionally, disintegration of surface materials can be caused, for example, by seismic waves, expansion and contraction in the day-night thermal cycle, and the expansion and contraction of water in pores and crevices of rocks as it changes from liquid to ice and back again. Material can be loosened by chemical reactions at the surface, particularly if there is an atmosphere, and by the alteration of surface materials through UV irradiation. Material can also be made subject to disintegration by the removal of adjacent material. Erosion is caused by the impacts of micrometeorites and raindrops, by wind-borne dust, and by the action of rivers and glaciers. Note that in this last case water need not be the agent. For example, you will see that on Mars, as well as water, CO2 ice plays a role, and on Titan CH4 acts analogously to water on Earth. Mass wasting is the downslope movement of loosened materials under the influence of gravity. Material can be loosened by all the processes that cause disintegration and erosion. Once sufficiently loosened, gravity does the rest. The distinctive feature of mass wasting is that transportation is downhill directly from where the material lay to its new location - there is no long-range transportation. One of many possible outcomes is shown in Figure 6.15, where mass wasting has produced the fan-shaped deposits. Whereas mass wasting can occur on the surface of any planetary body, aeolian processes require an atmosphere in which winds blow. Wind moves solid particles such as dust and sand, and it can move them over large distances before they are deposited. Small particles tend to be carried in the wind, and larger particles tend to bounce or creep along the surface. Windborne particles cause further erosion - Figure 6.16. Wind can also sculpt a sandy surface to create sand dunes, and these can creep over the landscape like slow waves. Accumulations of small particles are called sediments, and deposition from winds is one way of producing them. The more volatile constituents of a surface can be transported by becoming a gas, through either evaporation from a liquid, or sublimation from a solid, followed by motion through the atmosphere through winds or diffusion, to places where the gas condenses, either directly on the surface as frost, or in the atmosphere from where it precipitates. On Earth water is the volatile constituent. One of the more familiar results of liquid transport is the terrestrial system of river valleys resulting from surface drainage. The very existence of such systems is testimony to the large quantities of material eroded and moved downstream by the surface run-off of liquid water. Motion of groundwater near the surface and of water deeper underground also results in erosion and transportation. Valley glaciers and ice caps remove huge quantities of material, but rather more sedately. When glaciers and ice caps recede, characteristic landforms are left behind, such as valleys with U-shaped cross-sections. Lakes and oceans also erode materials, transport, and deposit them, as can be seen in landforms like cliffs and beaches, and in extensive deposits of sediments, particularly on ocean floors. Sediments deposited in water can subsequently be exposed if the oceans recede, or if a shallow lake dries up. dolomite (CaMg(CO3)2), is particularly susceptible, especially if the water contains dissolved CO2. The removal of limestone from under the Earth's surface has produced many magnificent underground caverns. 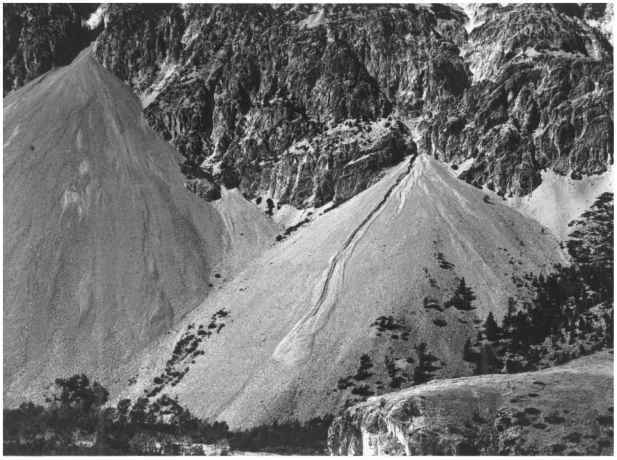 Many transport processes are inextricably linked with deposition, including all of the processes outlined above, from the short-range deposition in mass wasting to the long-range deposition of rivers. Deposits borne by fluids and by atmospheres are called sediments, and often form sedimentary rocks, as outlined in the next section. List the gradational processes to which a planetary surface is subject if the planet has an atmosphere but no surface liquids. A sediment, however formed, and wherever it lies, can form a sedimentary rock. Chemical cementation of the solid particles is an important part of the process, though modest pressure helps through the consolidation it produces. On the Earth, shale is a particularly abundant sedimentary rock, making up an estimated 4% of the upper 6 km of the Earth's crust. It consists of very fine grains derived from consolidated sediments. These sediments consisted of clays and silts, dominated by clay minerals in both cases but distinguished on the basis of size - clay particles are defined as those smaller than 1/256 mm across, and silt particles as those in the range 1/256-1/16 mm. Clay minerals are a common outcome of chemical modification of a sediment by water. One of the commonest processes of clay formation on Earth is the chemical decomposition of feldspar, (K, Na, Ca)AlSi3O8, by water, but other minerals are modified too. Clay minerals are also derived from insoluble minerals in limestone. One example of many clay minerals is montmorillonite. This has a large molecule with the formula (Al, Mg)8(Si4O10)3(OH)10.12H2O, which exemplifies the effect of water on silicates not only through the attached water molecules H2O but also through the presence of the water molecule fragment OH (hydroxyl). Limestone is another type of sedimentary rock, consisting mainly of cemented carbonate particles. A carbonate is a compound that contains the chemical unit CO3. A common terrestrial example is calcium carbonate, CaCO3. In addition to igneous and sedimentary rocks, there is just one other major rock type - metamor-phic rock. A metamorphic rock is an igneous or sedimentary rock that has been modified but not completely remelted. Metamorphosis can result from any combination of raised pressure, raised temperature, or a change in the chemical environment. For example, if shales are subject to a combination of raised pressure and temperature, then slate is a possible outcome. If granite is subjected to high pressure and temperature then granite-gneiss ('nice') is formed, with a prominent banded structure. Metamorphic rocks can result from magmatism, which raises the temperature of rock next to the magma, and might include modification of the rock by water. The cycling of rock through the interior can also result in metamorphism, through high pressure as well as high temperature. On the Earth this cycling is almost entirely a consequence of plate tectonics (Section 8.1.2), but on other bodies it might be achieved in some other way. Regardless of how metamorphic rocks are produced, this usually happens beneath the surface, and therefore they have to be transported upwards to be seen. Figure 6.17 summarises the processes described in Section 6.2. The three open arrows indicate that the processes apply to all three types of rock in the triangle. 'Subduction' denotes any process by which crustal materials are carried downwards, usually by (plate) tectonics. 'Uplift' is self-explanatory. Table 6.2 lists the planets and large satellites along with the processes that dominate their surfaces today.